A computer-savvy Pakistani spy, Masood Akhtar Haidar, alias Ramu, who was arrested in Ambala Cantonment two weeks back, was today produced before the Ilaqa Magistrate, Mr Nazar Singh, who remanded him in judicial custody for 14 days. He will now be produced in the court on April 22. The rules framed by the Education Department for regulating the privately managed schools in the state will be put up before the Haryana Cabinet for approval tomorrow. The prolonging US Iraq war has been adversely affecting the small-scale industry of Ambala Cantt manufacturing scientific instruments. The Additional Judge, Ambala, Mr Dharmbir Singh, sentenced life imprisonment to two persons of Mulana in a murder case. Haryana Chief Minister Om Prakash Chautala said yesterday that the state coffers were full and paucity of funds would not be allowed to come in the way of development in the state. Bharat Sanchar Nigam Limited ( BSNL) would provide telephone connections on demand, be it in cities or villages, said the Chief General Manager, Haryana Telecom Circle, Mr Anil Kumar Nagpal, while addressing mediapersons here today. Taking a lift has cost a Delhi businessman dear and landed him in hospital. Mr Tejinder Pal Singh who was returning to the National Capital Territory of Delhi after meeting his parents in Patiala, took a lift in a car, little realising that it would turn out to be a costly affair. A youth was killed and another seriously injured when they met with a freak accident while returning home after appearing in a examination. According to reports, Ramesh and Pawan, both students of Class IX and residents of Kharaiti Khera village had gone to Dhingsaran village to sit in the examination. 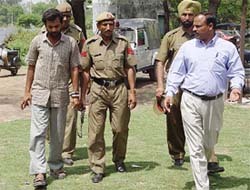 Addressing mediapersons at the end of the Pakistani spy’s 14- day police remand today, the Superintendent of Police, Mr Hardeep Singh Doon, said on the basis of a tip-off and information given by Masood during investigations, the police teams had raided some places in Hisar, including his residence. Vital military records, training records showing how the Army was trained, a camera and 60 negatives were seized from there. Some maps of cantonments in Punjab, Haryana and Rajasthan were also been recovered. The negatives mainly contained photographs of Ambala Cantonment, Chandimandir, Hanumangarh and Hisar cantonments, besides barracks and loading of Army vehicles. The SP refused to divulge much details about a floppy, which had also been seized from him but said it contained vital information about some sensitive Army areas and bridges in Punjab, Haryana and Rajasthan. He said making it public would not be in national interest. The SP said he would send his report to the DIG, CID, and the challan would be filed only after the necessary clearance from the Ministry of Home Affairs. The spy was arrested on March 26 while he was sending an e-mail to Pakistan from a cyber cafe on the Nicholson Road in Ambala Cantonment. A resident of Bhutto Nagar in Sahiwal, Punjab, in Pakistan, he had come to India on July 7, 2002. Masood had set up his base in Hisar due to the cantonment there and from there he had come to Ambala. This is the second time that a Pakistani spy has been arrested while indulging in espionage activity. Official sources said the rules would focus primarily on infrastructure of schools, facilities available to the students and the qualifications of teachers. The rules would be applicable to all private schools. It would be mandatory for any new school to conform to these rules. The existing schools already recognised by the government will also have to fill in a fresh form regarding their compliance with the rules. If an existing school is found wanting in any area, it will be given one year to fulfil the necessary criteria. However, there were a large number of unrecognised privately managed primary schools which might face the music now. “Whether such schools are also to be given time to conform to the guidelines will be decided at the Cabinet meeting tomorrow”, the sources said. It was learnt that the rules were framed in consultation with a committee of ministers headed by Finance Minister Sampat Singh. The meeting is also expected to take up a proposal by the Urban Development Department for modification of the existing house tax structure of the Faridabad Municipal Corporation. If the proposal is approved, the rate of house tax in Faridabad would go down and come at par with the tax rates in other Haryana towns. The prolonging US Iraq war has been adversely affecting the small-scale industry of Ambala Cantt manufacturing scientific instruments. Besides European countries, a number of gulf countries are major buyers of the instruments being exported by the manufacturers of Ambala Cantt. This industry, which has been passing through a slump, is likely to be the worst hit. The local manufacturers supply around 500 items of educational scientific instrument worth crores various educational institutions in Gulf countries every year. The entrepreneurs of Ambala have not received fresh supply orders for the last two months. The ready goods of the earlier orders for sending to those countries have not been delivered, so far, following the uncertainty in recovering the payments. Moreover, the payments of some of the manufacturers have been impended in Iraq, Kuwait and several other countries. It is estimated that scientific instruments worth Rs 40 crore were exported to the Gulf countries, including. Iraq, Kuwait, Saudi Arabia, Qatar, United Arab Emirates, Bahrain, Egypt, and Jordan. The manufacturer of scientific instruments of Ambala are already going through recession with the flooding of cheaper scientific instruments manufactured by Korea and China in the world market. Now the Gull war has added to their problems. According to information, there are around 500 small-scale industries at Ambala Cantt manufacturing scientific instruments. A large number of workers earn their livelihood through these industries. Since the industries have not been getting new orders so the units have started retrenching workers. Dr Anil Jain, president of the Scientific Instruments Manufactures Association, Ambala said the Gulf war was affecting the science industry here. He said if the war lasted long, the graph of the science instruments business would decline. Mr Jain said with the restructuring of Iraq after the war, the scientific industry of Ambala would get good business. He assessed that the scientific industry here might get the huge order of Rs 150 crore taking in view the export of scientific instruments to educational institutions over the past five years to Iraq. The Additional Judge, Ambala, Mr Dharmbir Singh, sentenced life imprisonment to two persons of Mulana in a murder case. The police had registered a case under Sections 302, 307,323, 34IPC and 25, 54 and 59 of the Arms Act and 5 of TADA Act against Jagmal Singh and Parmal Singh on April 18, 1989, for murdering Jasbir Singh. Besides these two another accused,Om Parkash involved in the incident died on April 20, 1989 and the remaining two persons were facing the trail. This judge observed in his order that the accused Jagmal and Parmal were sentenced to undergo rigorous imprisonment for life with a sum of Rs. 1000 each as fine for the offence punishable under Section 302 IPC. In default of the payment the convicts should have to further undergo a simple imprisonment of one month. The accused were also convicted for a period of six month and a fine of Rs 500 punishable under Section 323 IPC. The sentences awarded above to each accused should run concurrently, the Judge said in his order. According to prosecution on April 18, 1989, Om Parkash, Jagmal Singh and Parmal Singh went to the field of Jasbir to get the possession of a piece of land. Om Prakash, had a double-barrel gun while Jagmal had one 12 bore country-made pistol. Parmal Singh had a lathi in his possession. Om Prakash opened fire at Sukhbir Singh, the complainant in the case who managed to escape. Meanwhile, the deceased Jasbir Singh appeared there. Jagmal fired a shot from country-made pistol, which hit on the stomach of Jasbir and he fell down. Haryana Chief Minister Om Prakash Chautala said yesterday that the state coffers were full and paucity of funds would not be allowed to come in the way of development in the state. Mr Chautala was addressing a gathering during the Sarkar Aapke Dwar programme at Rattia in the district. The Chief Minister said the government had decided to undertake work of cleaning all canals and distributaries of silt from April 13 so that irrigation water could reach the tail end during the next sowing season. He told farmers that the government had completed all arrangements for the procurement of wheat crop and he would personally supervise procurement operations. Mr Chautala announced that the government would upgrade primary, middle and high schools for which the respective panchayats would complete the required norms regarding building and other infrastructure. He said villagers had been assigned the work of spending money for development activities in their respective villages. He said his government had set up village development committees (VDCs) for this purpose and money was sent directly to these committees. The Chief Minister listened to the grievances of panchayats under the Rattia Assembly constituency. The Chief Minister directed an Executive Engineer of the HVPN to replace all electricity iron poles in this constituency with those made of concrete. The Deputy Commissioner, Dr R.B. Langyaan, the SP, Mr K.K. Rao, the ADC, Mr C.R. Rana, the Haryana Rural Development Federation administrator, Mr Randhir Singh, the local MLA, Mr Jarnail Singh, an MLA, Mr Nishan Singh, a Haryana Finance Commission member, Mr Ram Kumar, a Haryana Planning Board member, Mr Mohan Lal Juneja, the INLD women wing president, Ms Krishana Poonia, the Zila Parishad chairperson, Ms Kailo Devi, and the SDM, Mr S.B. Lohia, were present on the occasion. As many as 54 tehsils in Haryana would be provided with WLL ( wireless in local loop) facility shortly and the process would be completed by the end of this financial year, he added. With a view to reduce the rate of faults in telephones, a policy has been formulated to make Haryana telecom circle poleless. As many as 23 cities in the state have been identified for the purpose and four cities, Jind, Narwana, Jullana and Safidon, have already been made poleless. Announcing the new tariff for prepaid mobile service ie Excel, he said it would be effective from April 16. For instance the cost of SMS messaging would be Re 1 per message. .
Later, the General Manager (Telecom), Mr V.K. Kakkar, said they were strengthening the customer care centres to give the BSNL consumers the best of services. While waiting for a bus at Ambala, Mr Tejinder Pal Singh was offered a lift by the occupants of a Delhi-bound car, which he readily accepted. On reaching Shahbad (Markanda), he was offered tea by his benefactors at a hotel, possibly laced with some intoxicant and he became unconscious. Before being dumped in Jhanjhari village in this district, he was allegedly robbed of his gold ring, watch, suitcase and Rs 20,400 in cash. Talking to UNI from the Civil Hospital here, Mr Tejinder Pal Singh said some residents of the village got him admitted to the hospital. After the examination both its boarded a private bus and sat on its rooftop as there was no space inside. As the bus did not stop at their village, they stood up and started making noise to seek the attention of the driver. Suddenly they hit against a tree. Pawan died on the spot while Ramesh was seriously injured. The bus driver and passengers came to know of the incident when they noticed blood dripping from the roof of the bus. Ramesh has been admitted to a local hospital with serious injuries. Persons roaming at the busy Namastey Chowk of the National Highway No. 1 had a providential escape today when LPG and diesel tankers dashed against each other. The driver of the diesel tanker Manjit Singh, has been admitted to the local Civil Hospital. Members of the Ambala Cantt Bar Association led by their president, Mr D.K. Bansal, met Mr Justice H.S. Bedi, Ambala Division Inspecting High Court Justice, and demanded the shifting of courts back to Ambala Cantonment. The courts had been temporarily shifted to Ambala City in the wake of the anti-mandal agitation after agitators burnt the court records. The location of the courts at a distance of 12 km is causing problems. Earlier, Mr Justice Bedi on his arrival was welcomed by Mr C.B. Jaglian, District and Sessions Judge, and other judicial officers. Prevention and awareness is the only cure for HIV/AIDS. To bring awareness on AIDS people can avail of the facility through the computerised voice response system on telephone No. 1097 round the clock, which will be toll free. Mr Vijayendra Kumar, Deputy Commissioner, said this here today.